Bennett Kayser, who represents District 5 on the LA Unified school board, is front and center tonight, facing his two rivals for the first time in a much anticipated candidate forum at Eagle Rock High School. 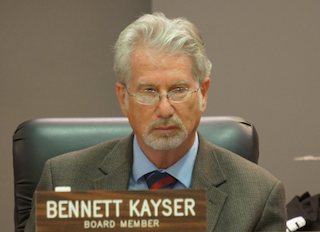 After suddenly pulling out of two forums last week, Kayser is appearing in the wake of a recent attack mailer that questioned his support for Latino students. The two-term board member, who is closely allied with the teachers union, said he cancelled due to scheduling issues, but an editorial in the LA Times questioned whether politics could have been a factor: the forums were hosted by the United Way-Los Angeles and ten other community and education groups that often don’t see eye to eye with Kayser. One of his opponents, educational consultant Andrew Thomas also canceled, leaving Ref Rodriguez, a 43-year-old community organizer and charter school founder to discuss issues on stage, alone. The controversial mailer, sponsored by the California Charter Schools Association, supported Rodriguez. Here is a list of the upcoming school board forums. An asterisk denotes the incumbent. Thursday, February 12, hosted by United Way in North Hollywood; 6 p.m. Details here. Tuesday, February 17, hosted by League of Women Voters and neighborhood councils in Canoga Park; 6 p.m. Details here. Wednesday, February 11, hosted by LA-32 Neighborhood Council in El Sereno; 6 p.m. Details here. Wednesday, February 18, hosted by the Mount Washington PTA and other Mount Washington-focused organizations in Mount Washington; 6:30 p.m. Details here. Candidates: Richard Vladovic, Euna Anderson and Lydia Gutierrez. Friday, February 6, hosted by United Way in Wilmington; 6 p.m.